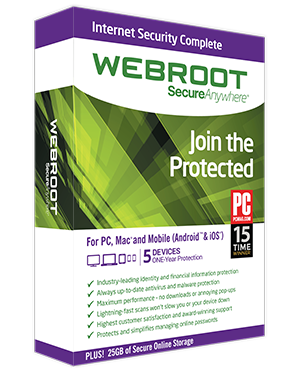 Webroot Internet Security Complete 2016 provides real-time protection for PCs, Macs and your Android/iOS devices, blocking viruses, malware, phishing attacks and identity theft. Repairs infected systems automatically so you don’t need to re-image. Our proprietary Webroot Intelligence Network is constantly updated with real-time information provided by more than 30 million worldwide users. With complete cloud support, Webroot protects against known and new threats in real time. Each Complete product will repair infected systems automatically so you don’t have to reimage. Webroot Internet Security Complete also protects your Android and iOS phones and tablets from malicious apps, links, and files. Secure Cloud Storage. Backs up files, photos, music and more with 25GB of secure online storage. Erases traces of online activity and frees up hard drive space by clearing unneeded files. Detects when a malicious, phishing or unsafe app has been downloaded onto your device and stops it in its tracks. Stores passwords, usernames and credit card numbers so you can access your accounts safely. You remember just one master password for secure access to all your online accounts. No matter where you are, you can manage all your devices from one simple dashboard. Surf from your mobile device safely while ensuring every link, including emails, text, and social networks is safe. SECURE BROWSING & REAL-TIME ANTI-PHISHING. Anti-phishing and privacy shields guard against identity theft and financial fraud. Get Webroot Internet Security Complete NOW!